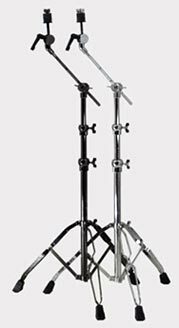 DrumsOnTheWeb.com - Manufacturers News - Download your favorite music for drummers and percussionists! DrumsOnTheWeb.com page... Drum Key - Manufacturers & Industry News - MRP Hardware !!!!!!! Sorry I've been out of touch for a short while but I'm sure you'll agree that its been worth the wait!!! For the last 17 months, I've been developing our own line of hardware to compliment our custom drums and I think you'll be pleased with the feature packed results. I think we'll become as well known for our hardware as the drums I build for cats just like yourself. That's because of the features and details I've built into the stands have the working player in mind! -They actually weigh 11 to 19% less than other companies similar stands !!!! Save that back of yours !!!! 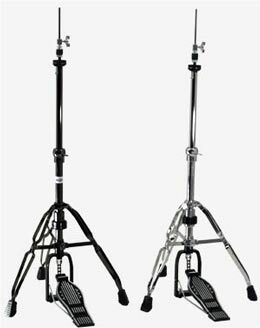 Do you really want to set your drum set apart from everyone else's? 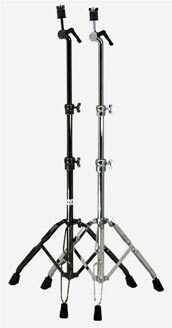 Chrome is the typically available hardware finish, but with MRP Hardware you can have your stands in the same durable Black Nickel Finish as you'll find on our Stainless Steel Snare drum!!!! It makes for one dramatic statement about you and your kit!!!!! Take a look for yourself!!!! MRP's Black Chrome Hardware has a brilliant mirror polished finish. Our finish is actually Polished Nickel unlike other Black Chrome versions which have a flat finish and resemble bad powder coating. 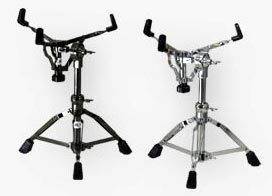 Just like our Custom Drums, MRP Hardware is available directly from the company only. You can see both finishes up close this week at the PASIC Show in Columbus, Ohio or contact me directly. I look forward to hearing from you and personally helping you with your hardware. Wait until you see what comes next!!!! 514 West Valley Stream Blvd.